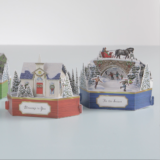 This holiday, Hallmark is launching an all-new card line Paper Wonder. Each Paper Wonder is an intricately designed work of art that unfolds, pops, or expands to reveal a surprise. The collection inspires people to explore, discover and share with the people they love.